Did you ever wonder about equivalent measures while making a recipe? Here's a helpful chart to help you out. Remember to use liquid measuring cups for liquids, and dry for dry. 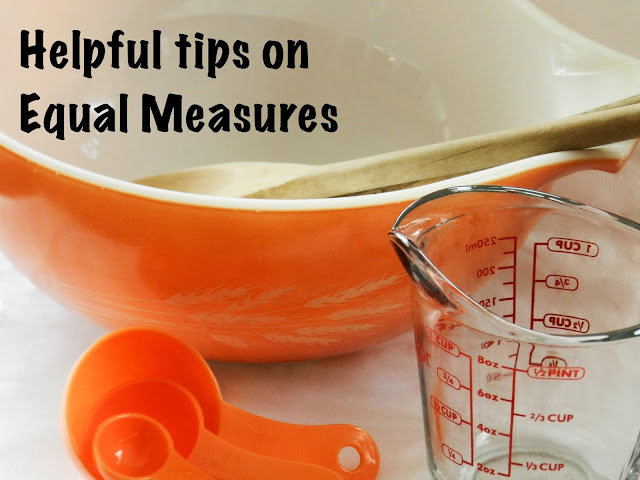 While they do measure the same, filling a 1 cup dry measuring cup to the brim with water will guarantee a bit of spillage before it reaches the bowl! Also note that in other countries dry ingredients are listed by weight vs. volume. While that is technically a more accurate way of measuring, I have not run into any major problems using volume.